Finding awesome front porch design ideas and sharing them with you is not only fun for us but we also hope helpful to you. Mary and I are very pleased to showcase these porches designed and constructed by Taylor Made Custom Contracting, located in Jarrettsville, MD. Deserving of numerous awards it has received, Taylor Made Custom Contracting is an innovative design and remodeling company. Their aesthetically pleasing front porch design ideas will inspire you. The perfect front porch design complements the architecture of your home, adds curb appeal, and is wonderfully functional. Whether it is a delightful portico or a large wrap around porch, it is essential to get the right design elements. As you will see in the photos below, Taylor Made Custom Contracting is a master at blending all the right ingredients to get the perfect porch. 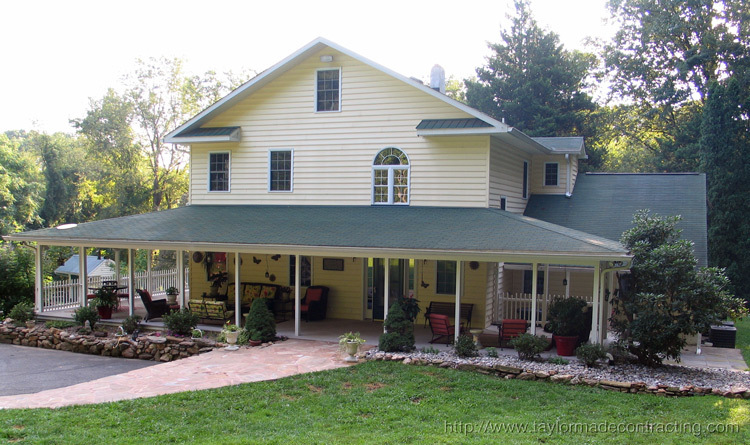 It is readily apparent the beautiful home below is enhanced by the wide country-style wrap around porch. This colorful and open wrap around porch is ideal for entertaining. It incorporates Trex® decking, vinyl siding, unique storage capabilities, weather-resistant furniture, fixtures, ceiling fans, and much more. Mary and I love open porches, that is, they do not have porch balustrades (railings). Aesthetically, open porches allow for an almost seamless transition from the outdoors to the interior of your home. Note the balustrade or railings on the left side of the porch. They are required because the height of the porch from the ground on that side is such that building codes require it. This porch is unique in that it has an open feel in front and the charming look of railings too. This is a great view of the seamless transition mentioned above. The porch provides great views of the surrounding yard while also allowing for protection from the sun, cooling by ceiling fans, and comfortable wrought iron and wicker furniture. Here's a perfect porch design idea that is often overlooked. Note how the porch columns actually maximize your view from the porch. Larger diameter columns and columns with pedestals tend to limit your view. In some cases this may be essential. However, if you have a beautiful view, ensure your porch design enhances your overall outdoor experience. People often ask Mary and I how deep of a porch should they build. We like to tell them as deep as you can as long as it fits your architecture and your budget! Usually 8 to 12 feet is perfect for furniture placement, traffic patterns, and entertaining. This particular wraparound porch is 12 feet deep. So spacious. 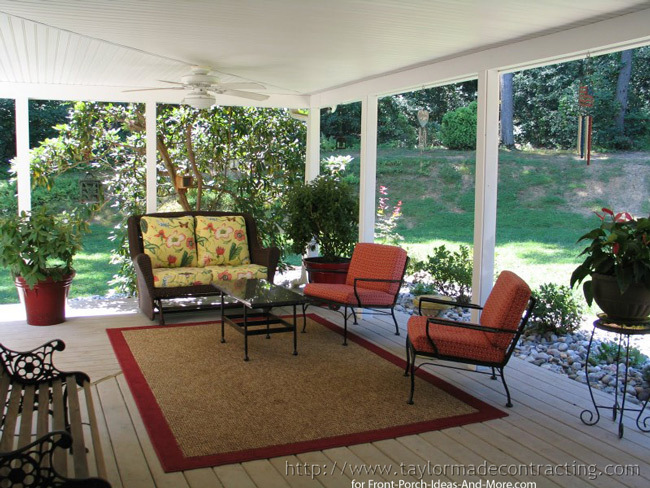 As you can see on this porch it is wide enough to accommodate furniture without interfering with traffic patterns. Front porch design ideas are not limited to just aesthetics. To really enjoy your porch other factors come into play like electrical requirements. Outdoor lighting and exterior fans are two options that most porch lovers usually include on their porch as shown in the photo below. 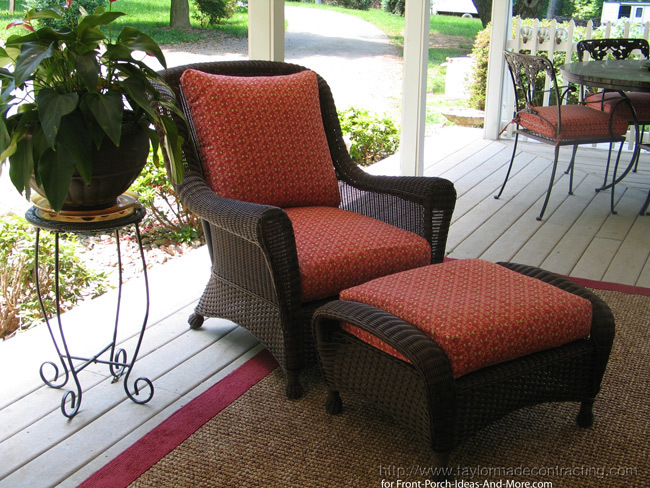 A very good idea to incorporate any porch design is minimizing maintenance. Taylor Custom Made Contracting used Trex® decking, a porch flooring material that is easy to maintain and will last a very long time. Taylor Made Custom Contracting are experts in universal design. The stone sidewalk leading to the front porch was built with accessibility in mind and has a slope of 12:1; ideal for those in wheelchairs and others with mobility issues. 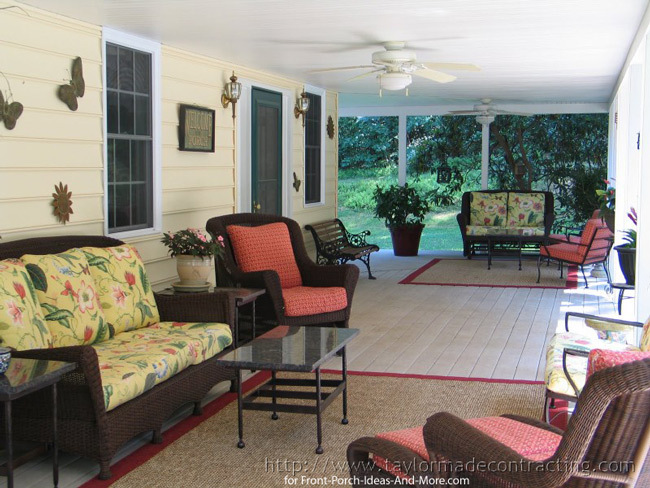 Making your porch accessible should be a consideration for any front porch design. 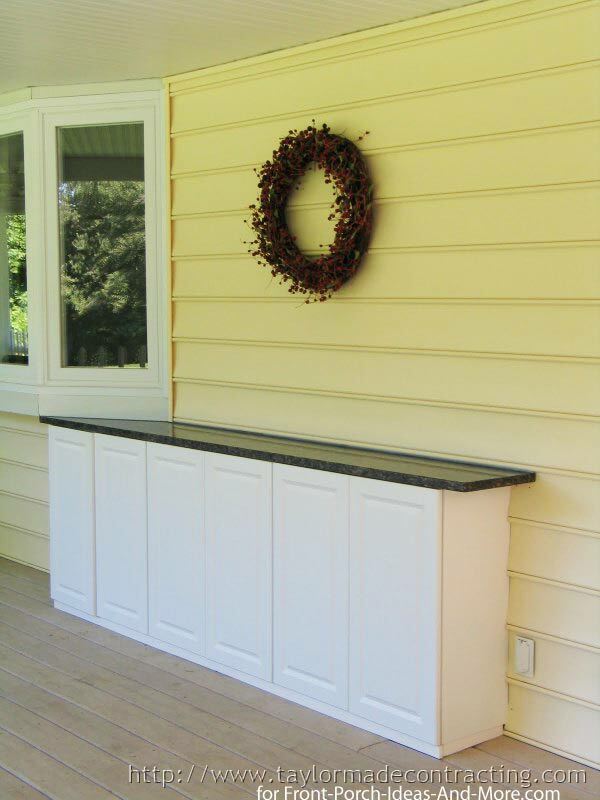 One of our favorite porch design ideas is to include storage cabinets or other receptacles for storing cushions, decorating, or other items on your porch. They can be either built-in or stand alone. This custom, granite-topped cabinet also acts as both a unique storage space and serving area. It's not everyday you get to see such an amazing transformation. This ranch home was almost totally destroyed by a fire; the stylish portico was built as part of an overall fire restoration project by Taylor Made Custom Contracting. Can you guess what their porch design idea is for this home? Stylish craftsman-style porch columns with brick and stone pedestals support a stained cedar ceiling. 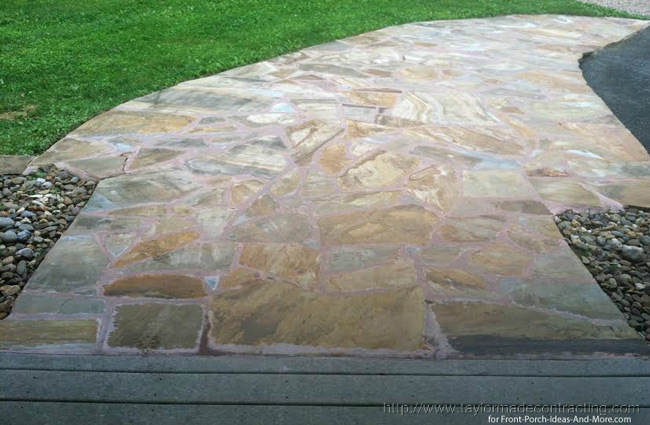 The portico's flooring is made from stone. Note how the portico's roof matches that of the adjacent garage roof. By simply adding shed-style returns on the portico's gable roof make the roofs lines architecturally the same simultaneously adding continuity to the structure. 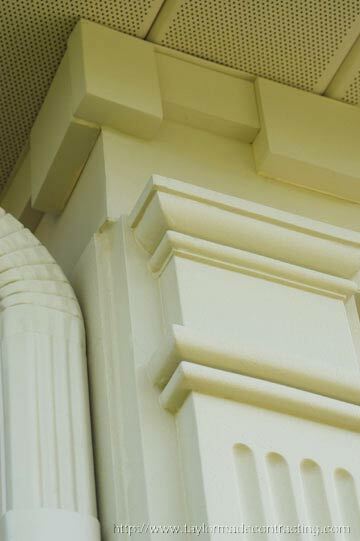 Whether building porches or porticos, details matter. The grey and white paint scheme adds additional appeal. 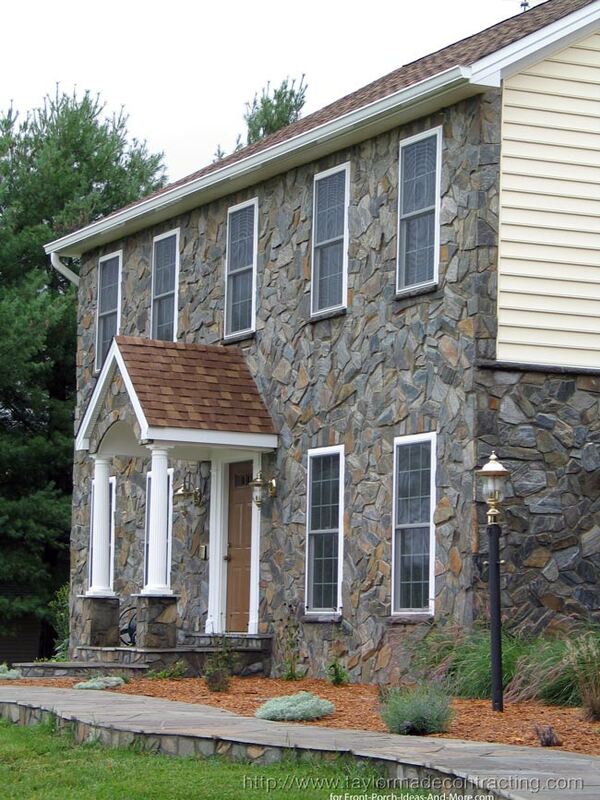 Take a modest two-story house and turn it into an eye-catching home! Note how the overgrown landscaping seems to overwhelm the house. This portico now includes slate flooring, an asphalt shingle roof, and fiberglass resin posts which sit atop stone pedestals. The addition of stone on the arch adds a touch of sophistication as does the beautiful lighting. The softer landscaping accentuates rather than detracts - this home is gorgeous! 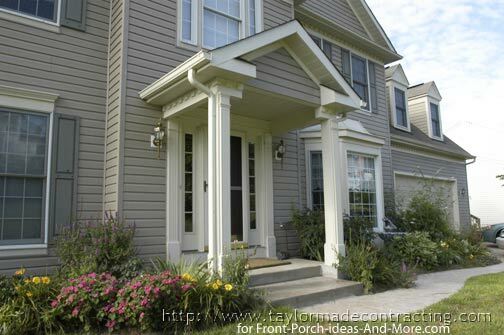 When designing a porch or portico make sure to address both the steps and walkway. The slate steps and raised slate walkway add elegance and beauty. Our collection of front porch design ideas wouldn't be complete without showing you how the right details create an appealing porch. 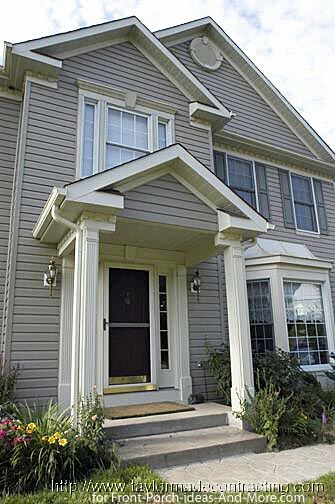 On the small porch below, Fypon® posts, dentil moldings, and trim work create an inviting portico. 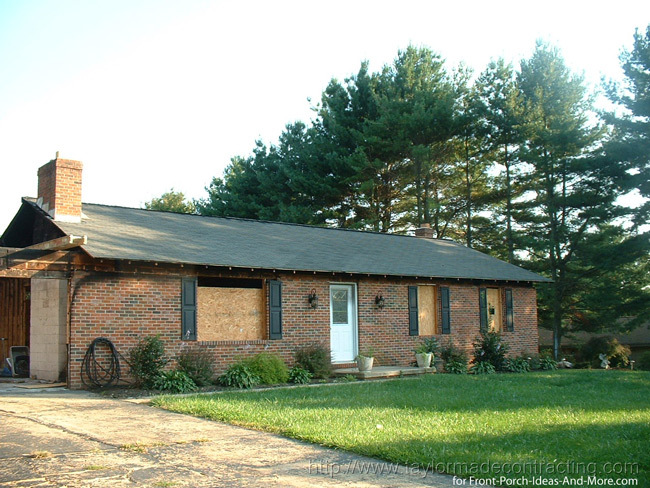 First, note how the identical gable roofs catch your eye. This makes the porch roof a prominent and impressive feature of the home. Second, the trim work around the light panels add dimension to an otherwise standard porch design. 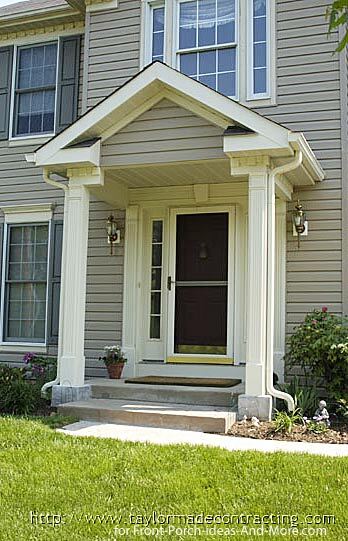 Dentil moldings (repeating ornamental small blocks) and well placed trim work can dress up almost any style porch. As a woodworker, I can attest that details make the difference between something being quite ordinary to creating a fine piece of workmanship. Adding or remodeling a porch is an investment and it takes both expertise and experience to do it right. We realize that perfection comes at a cost; but a cost that is well worth it in the end. Based on what Mary and I have seen, and if you live in the Baltimore, MD area, we highly recommend you visit with Taylor Made Custom Contracting who will share a lot more of their porch design ideas with you. We don't think you will be disappointed. They Build Awesome Decks Too! Taylor Made Custom Contracting is not only known for their beautiful porches, but also for building outstanding decks too. 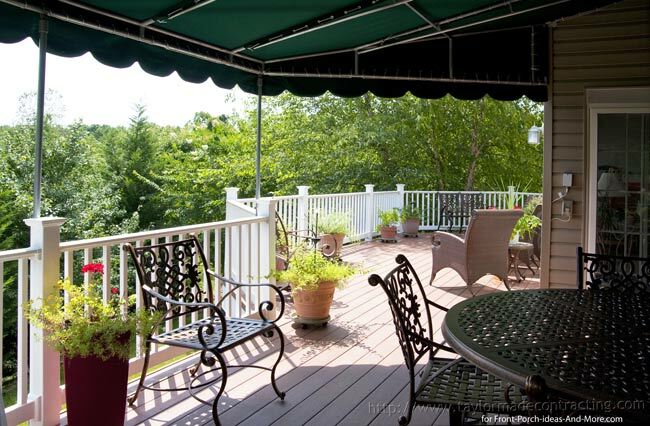 Who wouldn't want to relax or entertain on this spacious deck? 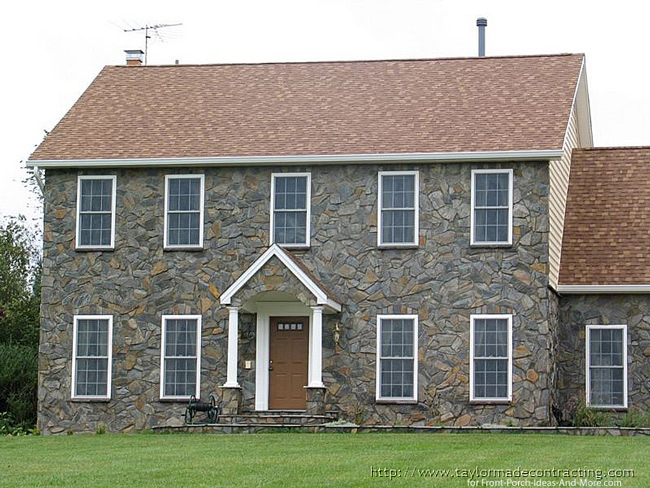 Taylor Made Custom Contracting is a recognized award winning construction and remodeling company in Maryland. 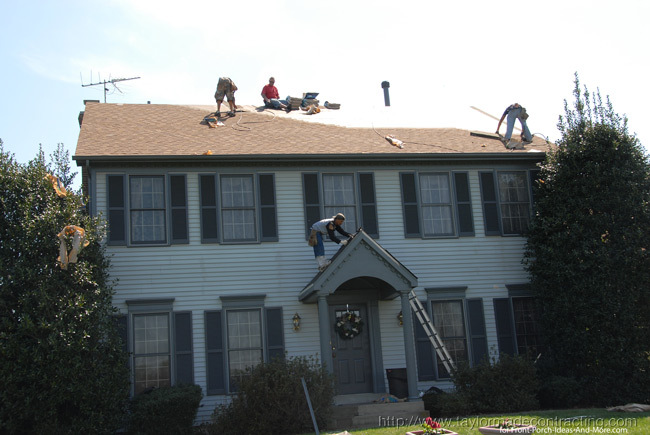 Recipient of Angie's List "Super Service Award" in 2010, 2011, 2012 and 2013 as well as four remodeling awards courtesy of the Home Builders Association, Kevin and Suzanne Taylor represent the best in service and quality. Taylor Made Custom Contracting is a Veterans Specially Adapted Housing Approved Builder along with being Universal Design specialists. Suzanne, a Certified Aging in Place Specialist, provides solutions and recommendations for aging and clients with mobility limitation. From wheelchair ramps to residential elevators and stair glides, Taylor Contracting can make your home totally accessible. 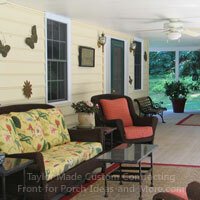 We appreciate Taylor Made Custom Contracting's porch design ideas. For those of you in the Baltimore MD area, contact Taylor Made Custom Contracting for your remodeling and construction needs. 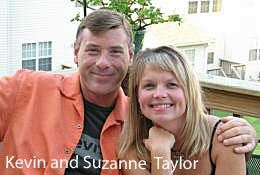 Please listen to the podcast we did with Suzanne Taylor about making your porch and home more accessible. 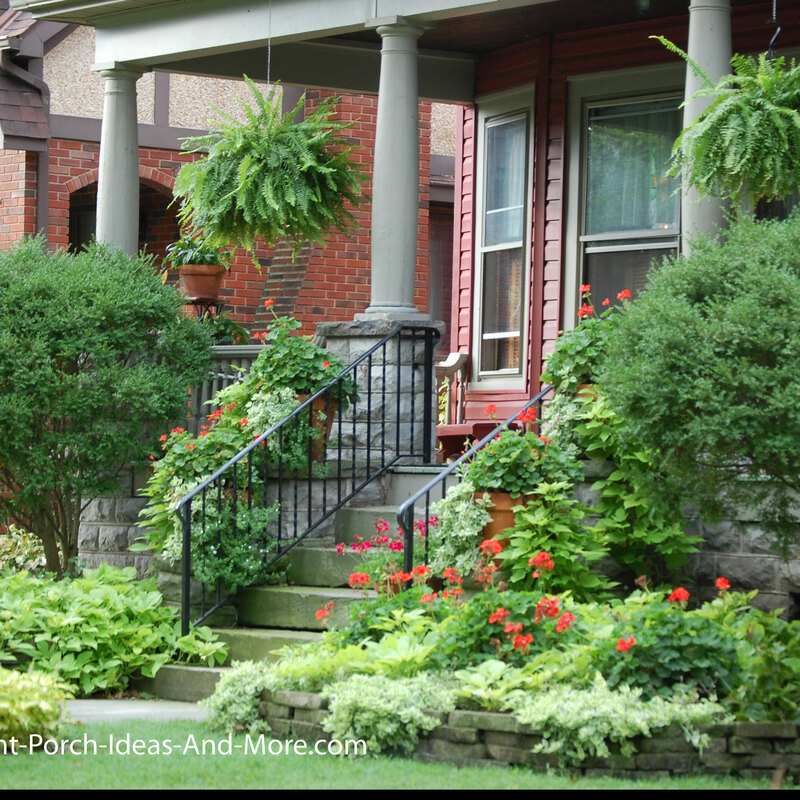 See this wonderful porch makeover by The Porch Company. The details make a difference.